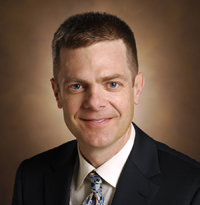 James Crowe Jr., M.D., director of the Vanderbilt Vaccine Center, is the 2017-2018 recipient of the Samuel Rosenthal Prize for Excellence in Academic Pediatrics. The $50,000 prize from the Leighton A. Rosenthal Family Foundation and the Milton A. and Charlotte R. Kramer Charitable Foundation, both in Cleveland, Ohio, will be awarded over two years to Vanderbilt University Medical Center (VUMC) to pay direct costs for Crowe’s research and education activities. Crowe is the Ann Scott Carell Professor and professor of Pediatrics and Pathology, Microbiology and Immunology. He was recognized for excellence in studies of the human immune response to pediatric infections and vaccination. The Samuel Rosenthal Prize, which has been awarded annually since 2010, is named for the late Cleveland philanthropist and founder of the Cleveland Overall Co., a manufacturer of industrial uniforms that became the Work Wear Corp.
Crowe’s laboratory studies the molecular, genetic and structural basis of human immune responses to virus infection or vaccination. He has studied antibody-mediated immunity to a wide variety of viral pediatric pathogens, including RSV, MPV, influenza, rotavirus and norovirus, and also agents of bioterror and emerging infectious diseases, including chikungunya virus, dengue viruses, Ebola and Marburg viruses, Zika virus and others. Crowe and his colleagues are developing new methods in computational immunology for rational design of vaccines and antibodies. He also directs the Human Immunome Project, an ambitious effort to identify the sequence of all transcripts for adaptive immune receptors on the planet. Crowe has won numerous awards for his research. He is an elected member of the National Academy of Medicine and a fellow of the American Academy of Microbiology, the American Association for the Advancement of Science, the American Society for Clinical Investigation, the American Pediatric Society and others.